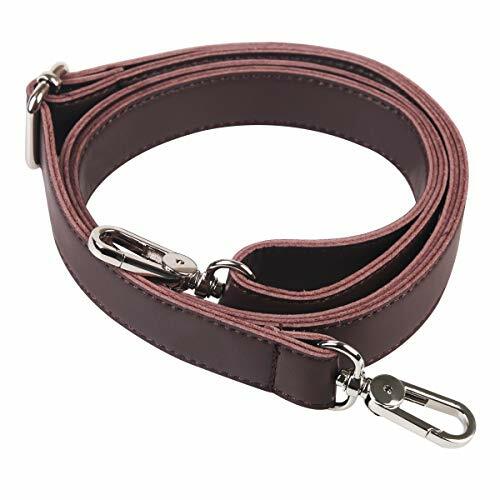 Good replacement: These 2 colors removable shoulder chain strap are suitable for shoulder bag, Cross-body bags, wallets, clutch. You can use them to replace the plain one or worn one. 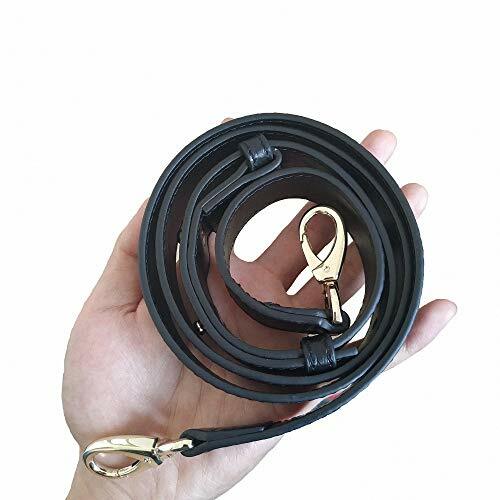 Size: Total length (buckles included): 120 cm (about 47.2 inches); Chain width: 1 cm (0.4 inch); Thickness: 2.5 mm (0.1 inch) Metal buckles: Easy to install and can last a long time, sturdy enough and not easy to broken. 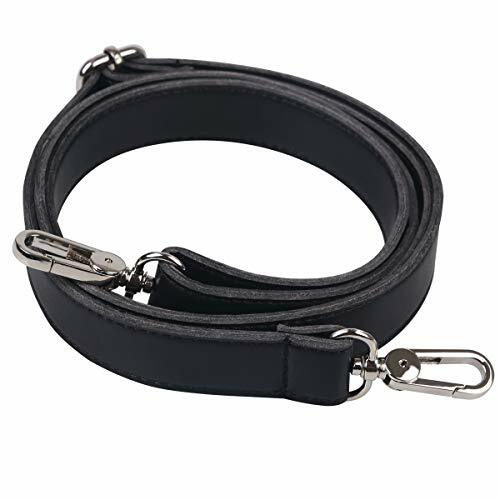 Buckle length: 3.3 cm (about 1.3 inch); Snaps fit bag rings up to 7 mm in thickness or smaller. The metal strap is comfortable, you can install it as a cross body. Not easy to fade: Good quality metal, special process plating finish, not easy to fade. 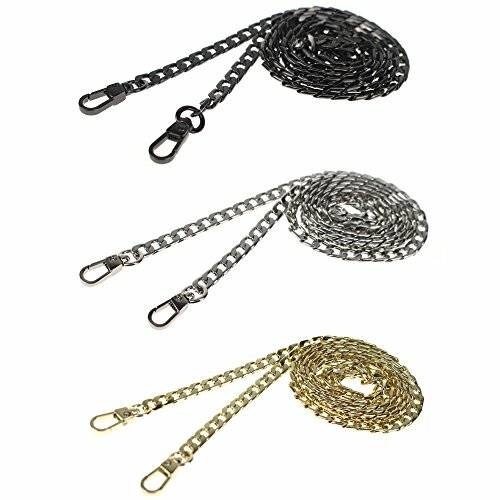 Removable shoulder chains color: silver, golden black Package includes: 1 x Silver replacement chain 1 x Golden replacement chain 1 x Gun-black replacement chain Warm notice: 1. 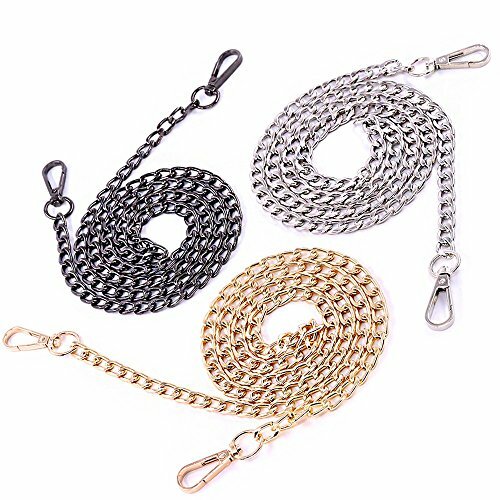 These long crossbody chains are made of metal, their weights are relatively heavy, not suit for the customers who like lightweight chains. 2. These crossbody chains are folded in the package during the transportation, so there will be some uneven places, you can manually flatten them. 1, FASHION GIRLS --- Fashion bloggers will carry different bags when shopping, Different kinds of bags with different colors of the chain, the effect is not the same, Carrying a nice bag matching beautiful color, who is not a fashion girl or boy? 2, BEAUTIFUL AND PRACTICAL --- Polished and polished, multi-layer electroplating, high color fastness and glossy gloss. Toughness, good ductility, beauty and durability. 3, ADVANCED MATERIAL --- The chain is made from materials of the same grade as luxury goods. 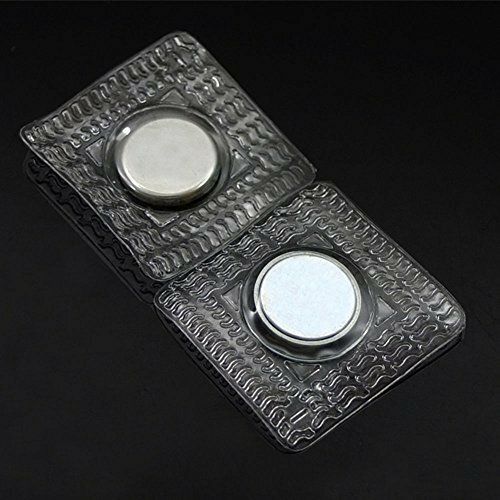 No harm to the human body, no allergic reactions, the metal material used is also very strong. 4, BEFORE TO USE --- Because the length of the bag is different from the height of the individual, the weight and the use habit, it is suggested that you measure the length of the shoulder strap or chain before you buy it. But if it is too long, you can shorten the length according to our illustration. 5, WARM REMINDER --- All physical shooting, but it may also be due to the lighting, camera and other factors during the shooting. It may cause the difference between the actual color of the picture and the product. The color is based on the material object. At the same time, due to manual measurement, the error of 1-3cm will be normal. The specific size should be based on physical objects. to avoid causing an unnecessary mistake,pls check the size carefully and take a measurement with a similar article by yourself before purchase! Mini Evening Clutch 5.5inch*4.5inch/ 14cm (L) x 11 cm (H) ;It can't holds iphone 6/iphonoe 7/iphone 8. 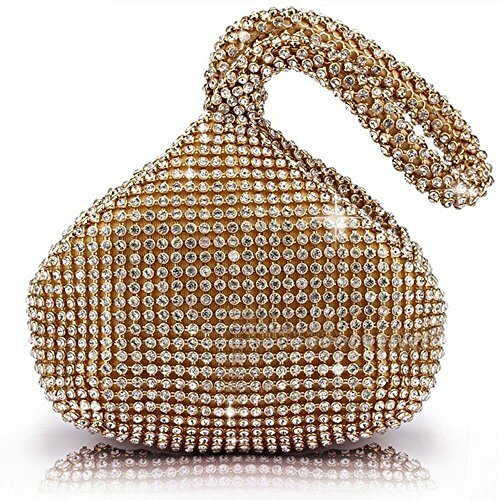 Full Rhinestone Outside Made of high quality full soft dazzling rhinestone and fabric lining ,with zipper can be opened and closed smoothly will more attractive. 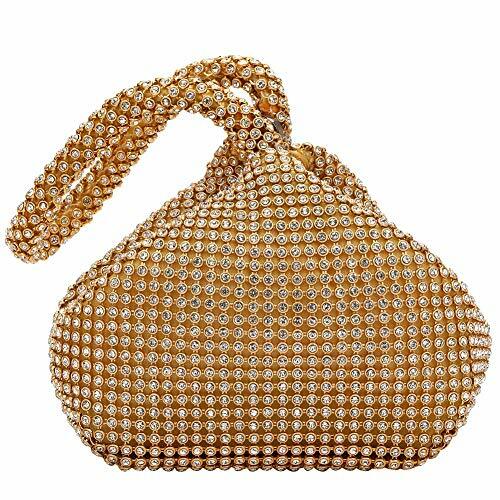 Best GIFT Ideal This exquisite bag conform to all fashion elements, And we also think it will be a perfect for Wedding/ birthday / adult gift to your wife, lover, daughter, or other important person. 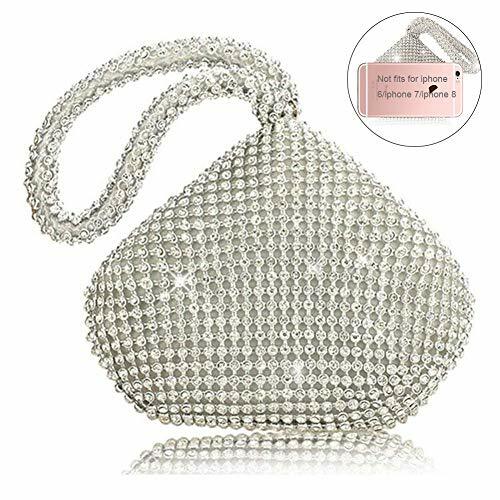 Occasions The evening little bag elegant design with sparking beadings, silky satin lining ,special formal occasions or important moment of life or business, like wedding, engagement, social Activities. from make-up, hair style, dress, shoes,necklace, clutch and other accessories, it will be never too choosy to capture every best time. 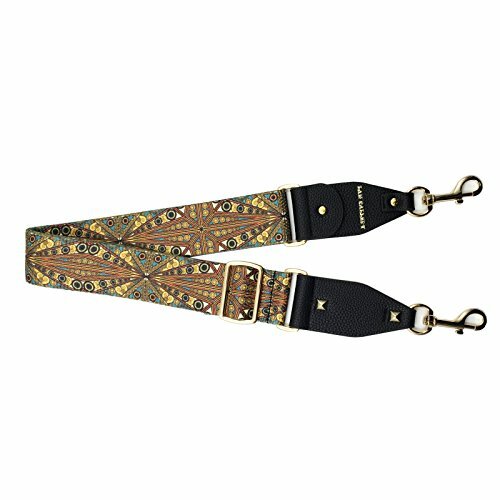 Three Different Color Luxury Purse Strap for Your Best Choice! Metal excellent polished. Not easy to fade. About 43 Inches in length, 7mm in widthenough for handbag or purse. About 3.5 ounces in weight. Unique shape of strap, Excellent in craft, shiny tone. 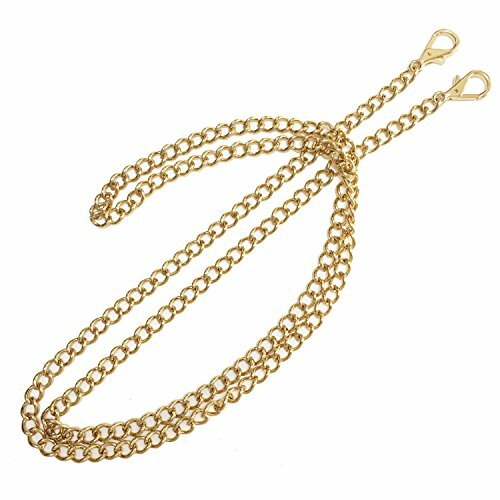 Unique luxury shape of strap, Excellent in craft, shiny tone. Three colors meet your choice. Approximately Length 43 Inches (two buckles not included). 7mm in width of the chain and 30mm length of each clasp. 3. A little smell is normal for a new leather shoulder strap, the smell will disappear in few days. 4. BOMKEE always provide quality products and comfortable shopping experience for the global customers , thank you! Universal Replacement Adjustable Shoulder Strap For Lots of Bags:crossbody bag,messenger bag,laptop bag,wallet purse,camera bag,shoulder bag,handbag,duffel bag,briefcase. 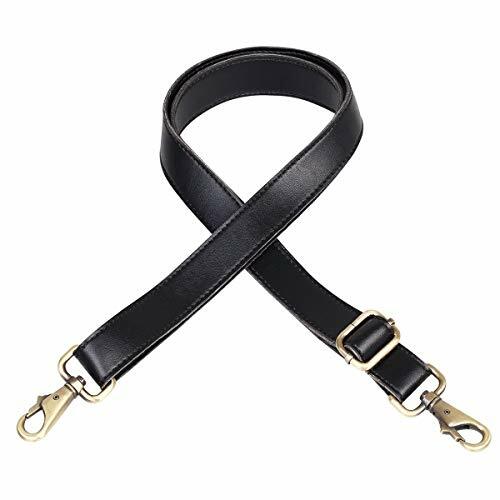 Easy Adjustment:The leather shoulder strap adjusts from 33.5 - 61 inch;Strap Width:1 inch. The Strap Material:The shoulder strap use high quality PU leather,Top grade materials will provide you with years of use and comfort. 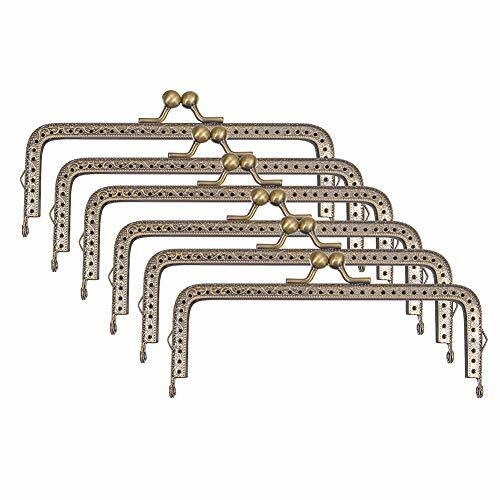 Hooks Material:Metal.Allows for 360 degree rotation and Super sturdy. Long Warranty:24-month BOMKEE Warranty with Amazon 30 days Full Refund Guarantee.Package included:1 x PU Leather Replacement Shoulder Strap. Snap diameter: 13mm or 1/2" Square pvc size:28mm or 1.1"
Easy to sew over with machine, making it completely invisible on the outside of the bag. Use on bags, totes, backpacks, jacket pockets, purses and lanyards. Material: Top quality nuatural full grain leather strap and metal buckles. Adjustable length: Adjustable length in a range of 26 to 51(65-130CM). Long enough for a crossbody bag. Width: 0.71(1.8CM). Great quality and craftsmanship: soft& durable artwork with elite workmanship, the sturdy metal buckles are easy to install and replace. Classic design: Great replacement strap or handle for DIY bag, such as handbags, clutches, cross-body bags, purses etc. 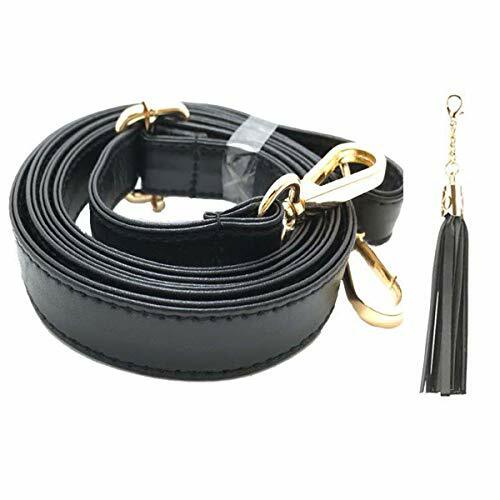 Length :120cm( 47.3 inch ) Include the clasps. Unadjustable. Material: Vachetta leather: Vachetta is premium cowhide leather, it is untreated Italian leather often used in luggage and handbag trimming. It will go a dark brown shade over the years and with use. To find out the fitness length of strap, we recommend using a piece of string, attached to your bag, and adjusted until the length is just right. Normally, smaller bags use smaller width straps, and larger bags use larger width straps. But of course, you are welcome to pick the length you prefer since everyone has different preferences! Material: Vachetta leather: Vachetta is premium cowhide leather, it is untreated Italian leather often used in luggage and handbag trimming. It will go a dark brown shade over the years and with use. 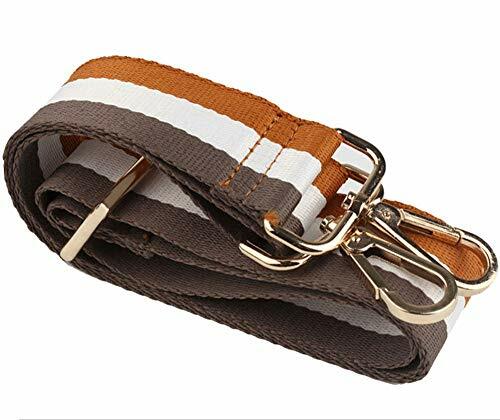 To find out the fitness length of strap, we recommend using a piece of string, attached to your bag, and adjusted until the length is just right. 1. The color may vary slightly from the online image due to monitor color settings. 2. A little smell is normal for a new bag, putting it outside for few days, the smell will disappear. 3. Please note before placing order: the goods ship from Lam Gallery will takes 7-15 days for arrival(the order fulfilled by amazon please ignore this message). 4. Lam Gallery always provide quality products for every customer, thank you! 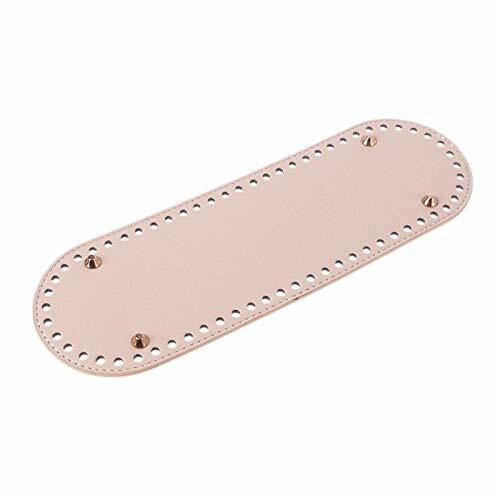 Classic Replacement Strap or Handle for handbags, purses, clutches, etc. Length Adjustable, From 28 to 50, Strap width 2. High quality gold metal buckles,Ensure the installation sturdy. 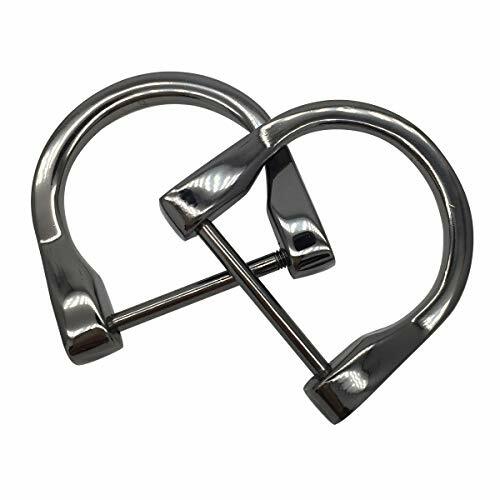 Buckle length: 4.5cm(about 1.8); Snaps fit bag rings up to 8mm in thickness or smaller. Package weight: 117g. Lightweight and sturdy. 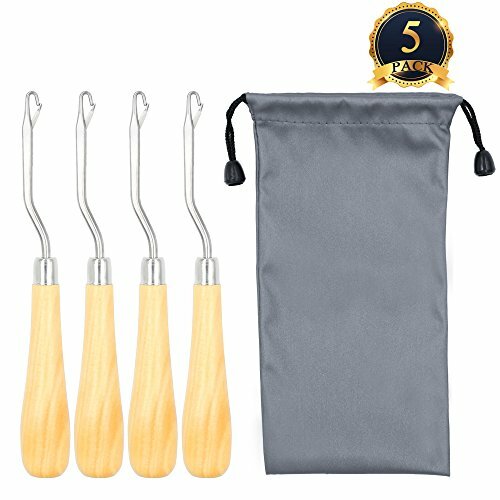 Package includes 4 pcs wooden bent latch hook tool. Made of durable wooden handle and metal hook. Bonus one silver storage bag to store latch hook. Can create beautiful latched rugs and other art crafts. Not heavy, more convenient to use. Easy Adjustment:The shoulder strap adjusts from 33.5 - 61 inch;Strap Width:1 inch. This shoulder strap hook can safely hold 534 pounds (267 pounds per Hook) and easily clip onto your existing strap clips. 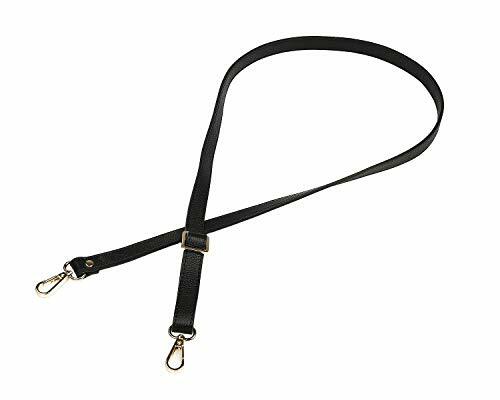 this shoulder strap is universal. 2. Due to the difference of the measurement method, pls allow 0.3-1.1 inch size error. 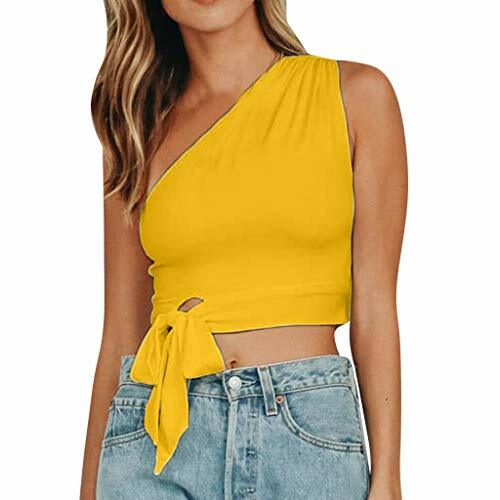 High-quality fabric lightweight and comfortable.,Elastic fabric delivers a loose-fit comfort yet with an ultra chic look. It's perfect for daily wear, outdoor activities, dates and parties. Easy to match with boots, high heels with your favorite Shoes, jewelry, bags and casual shoes to make you more beautiful. Perfect as a gift send to Lover, Family and Friends when Valentine's Day, Birthday and other Festival ! Note : Due to possible physical differences between different monitors, the product photography is illustrative only and may not precisely reflect the actual color of the item received. Money-back Guarantee : on all purchased items including any defective products, or ones you simply didn't like. After Sales Service : We will always provide the best service for you and try our best to let you have a good shopping experience. If you have any question or advice, please feel free to tell us, you can get reply in 24 hours. DESIGN : The design blend classic femininity with contemporary trends is unparalleled. It's an indispensable dress in your closet. MATCH : You can dress it up very easily with any combination of sandals, heels,flip flops or even sneakers. OCCASION : Good for Casual, Work out, Party, Club, Night Out, Holiday, Beach and so on. ABOUT SIZE : Please do understand due to manual measurement may have inevitable deviations, refer to our size measurement before ordering. SERVICE : We will always provide the best service for you and try our best to let you have a good shopping experience. If you have any question or advice, please feel free to tell us, you can get reply in 24 hours. For bag purse DIY making. Wrapped beads with a cloth, pliers the bead with vise, rotate head clockwise.Pay attention not to cut your hand. Wrapped beads with a cloth, pliers the bead with vise, rotate head counter-clockwise. 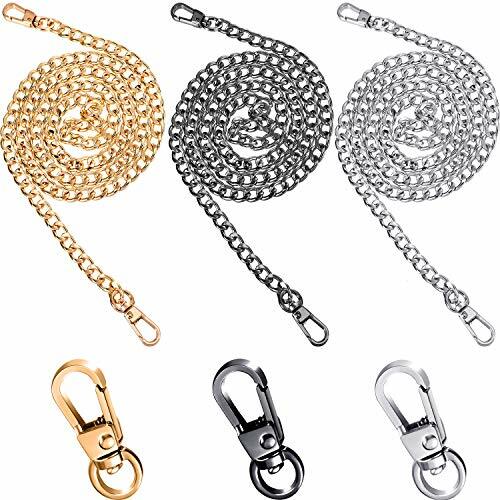 Bag/Purse Clasp Lock:Made of premium metal material to ensure the high quality.They are resistant and not easy to rust, provide you excellent using experience. Very delicate lotus head design,intermediate inserts a small smooth bead. Retro carved,It's fashion, creative, full of special making ways, perfect for purse/bag DIY crafts. Quality Assurance If have any quality problem, you can contact us freely to get a return or a replacement. 3 Colors as picture shown are provided, all of them are nice and bright, it goes well with most bags of different color and various styles, meeting your needs. It can applied to handbag, clutches, cross-body bags, purse and more, you can DIY your bags and change its chain to give them a new look. Made of zinc alloy, it is stylish, durable and not easy to wear. The electroplating process is colored, the double-sided sealing glaze is durable and not easy to fade. Suitable for all types of clothing and bags. 1" (25 mm) Interior width of crossbar, so use with 1" or less strap wide. 1.1 (28 mm) Height vertically from crossbar to Interior center. Approximate thickness of metal is 4mm. 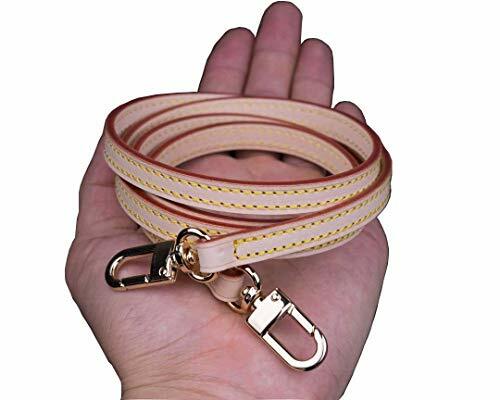 This is a very pretty strap, made by canvas cotton and PU leather, with gold hardware, nice look gold metal buckles, easy to attach and remove. A fun way to add your own personality to your bag too! This guitar style is very popular, allows your bag to be worn securely, frees up your hands, provides the comfort to your shoulder. Stretch lenght clasp to clasp adjust from 80-135cm/31-53, 3.8cm/1.5wide. Can be worn as a crossbody strap or double as a shoulder strap. Works with so many purses, match perfectly with Leather handbags, Canvas totes, nylon luggage bags. For bag making, embelishment, guitar strap etc. Adds a character and boldness on your project. If you have any questions just contact us, we will do our best for you. 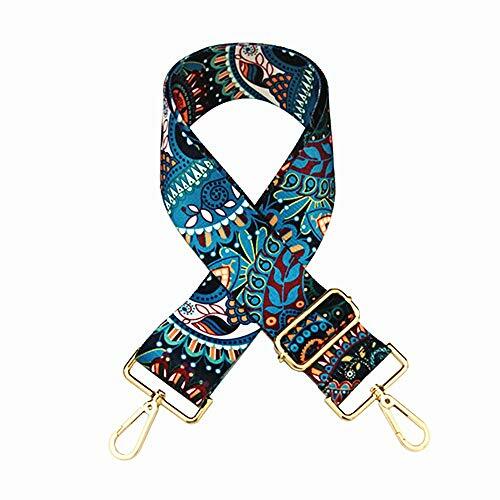 Great replacement strap for diy bag, such as handbags, clutches, cross-body bags, purses, shoulder bags etc. 100% SATISFACTION GUARANTEE- If there is any quality problem with the Bag parts accessories, please contact us and we will refund your money or provide a new Bag parts accessories, we want to ensure your are 100% satisfied!